There is nothing better than sitting down with a decent puzzler. But in order for that puzzler to be good, it has to tread the fine line between test, enjoyment and frustration. It’s okay to bend that line, and just occasionally it’s fine to cross it, but should the experience head into either of the three elements too much, any willing participant will no doubt be put off. 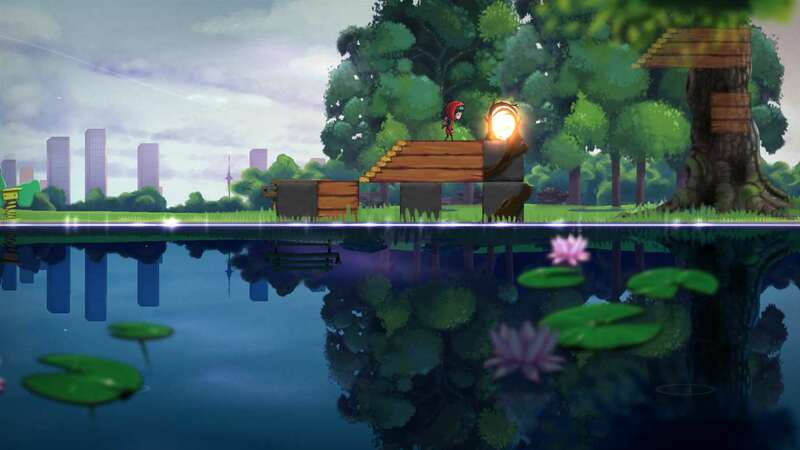 Samsara is one of the latest titles to push the boundaries, building in an art of reflection to the usual puzzle genre – in more ways than one. Playing as Zee, a young girl who has fallen through a portal into a world of echoes, you’ll be granted with helping her, and the strange shadow child who mysteriously lives in those parts, to safety. This is done by placing various blocks, all of which come in different sizes, shapes and properties, down onto a pool of reflection in order to create a stable walkway for Zee, and her dark companion, to wander to safety. Leave a gap and either one of them will fall into the reflective pool which separates the world, to be lost forever. Or at least to send you back to have another try of the stage. Each of the 77 puzzles included are relatively simple affairs, at least once you get your head around the placements, rotations and effects of each piece. 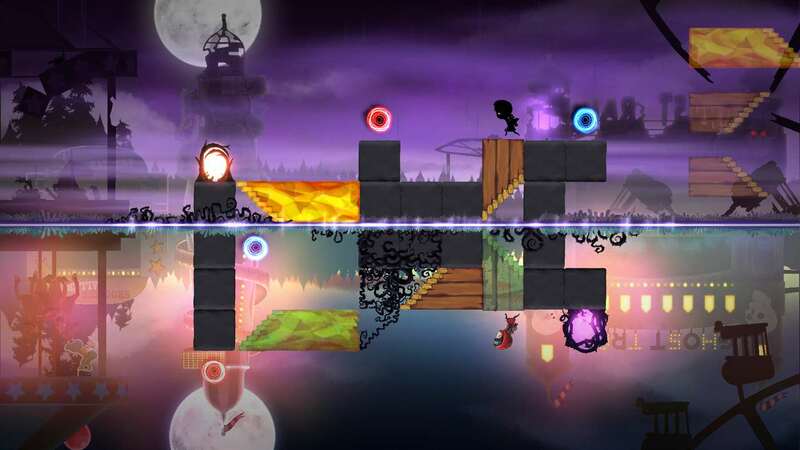 You see, with a limited number of blocks available for each level, and any placement in the dark upside-down world being mirrored above, it could well get a bit tricky. That trickiness could well be increased when you take into account the fact that whilst certain blocks will move in accordance of gravity, others will be repelled by the pool of reflection, with more still dropping like lead balloons the second they are placed. This is where the mind bending moments come in, but with Samsara walking you through the basics, and any newly added block elements, safely and in a straightforward manner, never do things get too tough to handle. But placing a simple blocky walkway isn’t all that Samsara brings – red and blue portals add in an additional element of test, whilst thorny vines that appear and disappear as Zee and her friend walk over them are clever additions that add in timed movements. Honestly though, the latter stages that utilise these mechanics have come across as even easier affairs, mostly because you can plan your route to and from them with ease, limiting the overall block placements considerably. 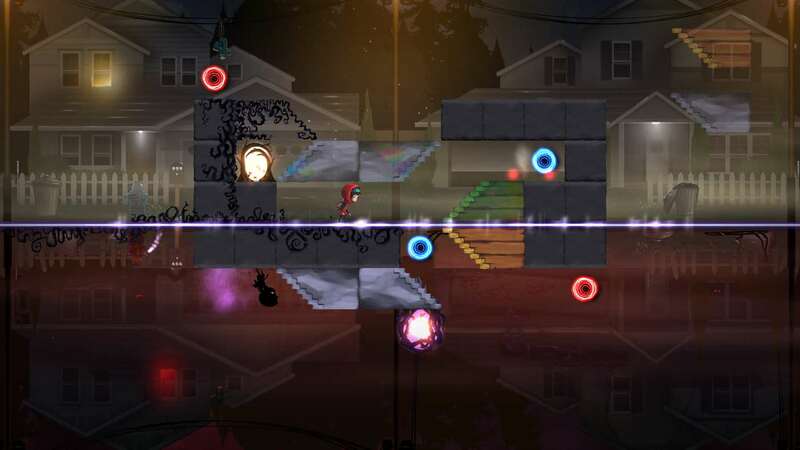 Should you find trouble with any of the puzzles laid out in front of you, it’s good to be able to completely inverse the stage, giving a bit of a different perspective on matters. Inverting doesn’t ever switch anything up – and it would be great to be able to use this with a simple press of an unused face button instead of having to succumb to the menu screen – but the option is a welcome one. With that opportunity in place, Samsara just needs a level head for full completion purposes and the saving of both Zee and her mysterious counterpart. Aside from a couple of stages which just need a bit of time, and one of the 77 that proves particularly troublesome – at least to me – most of what is found within Samsara is simple enough. And in my opinion, that is the sign of a decent little game. Gone are the days when I want to be left screaming and throwing controllers. I want a nice worthwhile experience that will push my brain into working mode, without ever crossing those lines mentioned earlier. Samsara does that. Just about. The problem though is that the entire experience is very short. With 77 stages in place, you could well imagine that you’d be sat there for a good length of time trying to figure out the puzzling nature of each stage. But like mentioned previously, other than one or two, the rest are pretty much over in a matter of a minute or two. You’ll obviously need a way with shapes, and a full understanding of how the mirror and reflection mechanics works is key, but getting your noggin around that is all that is required in order to solve the basic solutions. So whilst the puzzles are basic, it must be said that in regards a visual aspect, Samsara more than delivers. The characters, blocks and stages themselves are well created, but it is in the backgrounds with which really the whole experience kicks in to life; the Ghost Train stages are particularly memorable, with the screams of young children enjoying themselves playing out in stark contrast to the strange world in front of it. It is only in these levels where any decent audio quality comes in though. With achievements aplenty for nailing each of the six realms that contain the stages, and only a few hidden secret ones sitting there requiring a second playthrough, there is little found in Samsara that will have you going back over things more than once. You could easily run through everything in just a couple of hours, before being asked to roll over them again with things inversed, and for the price I’m really wanting a little more in terms of proper puzzling content, but what has been created is good enough to warrant Samsara deserving of a little look. Don’t expect to be blown away, but should you fancy spending some time with a reflective puzzler, then Samsara will get you thinking.